Who doesn’t like to have his own ringtone that talks about him, and who is the one that doesn’t want to make a specific verse of a song as his ringtone to be known with or because he loves it! In the old days, we used to use computer software to make our own ringtones, those programs have often required some knowledge and also required reading some How-Tos articles to know how to use them. But now, it’s become much easier when it comes to making your own ringtones using your smartphone with no prior knowledge or training needed as before. 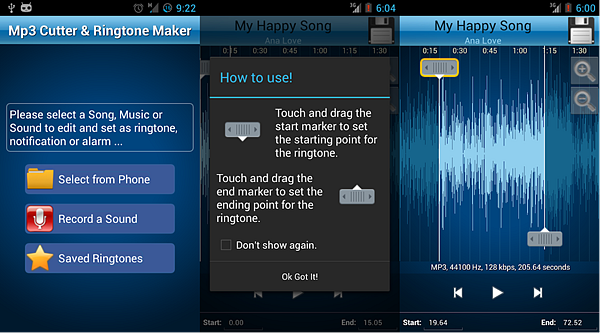 As usual, among the huge number of applications offered via Google Play Store, there are few apps that deserve to be used, for that, I will provide you with the 5 best ringtone maker apps for Android to choose the most suitable for you from them. This is my personal favorite ringtone maker app and I use it since it has been launched, this little free ringtone maker app allows you to do many things without paying a penny including the ability to record an audio/music to edit it, the ability to edit sounds saved on Mobile/SD, set a start & end for the audio clip and more. The MP3 Cutter also allows you to manually set a start and end using its easy-to-use waveform representation, and to automatically set the new clip as the default ringtone or assign it to contacts. The application is totally free including all its features but has some apps that you may ignore when compared to the functions it offers. This was the first ringtone maker for android as it’s first published in 2008. Ringdroid allows you to create your personal ringtones for everything on your phone whether it’s an alarm tone, notifications, ringtones or anything else. The best thing about Ringdroid is that it’s an open-source project, meaning that it doesn’t contain any kind of ads. For a lower version of Android like Android 3.0 to Android 4.0.3, you better use Ringdroid 2.6, and for earlier versions, you should use 2.5. Don’t worry about the version of the application, as Google Play Store automatically installs the suitable version with your Android system. Another ringtone maker app that allows you to make your own special ringtones using the waveform representations of the audio file at 6 zoom levels for more accuracy with many other features like fading in and out, adjusting volume for mp3 files, along with the ability to record a new audio clip to be edited using it. It also helps you find your track easily as it sorts them by albums and artists, and you manage your contacts’ ringtones. For saving your audio files, you can save them as music, ringtone, alarm, or notification to reach them easily whenever you want. 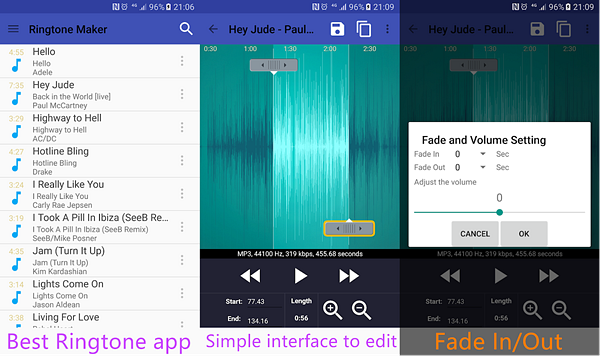 This application has the second-best interface among the others, with many features included including cutting any type of audio files by scanning your music stored in your phone with its built-in file explorer, along with supporting many audio formats including MP3, WAV, AAC, 3GPP, and M4A to edit them all and produce a good quality files to use as ringtones or notifications sounds. 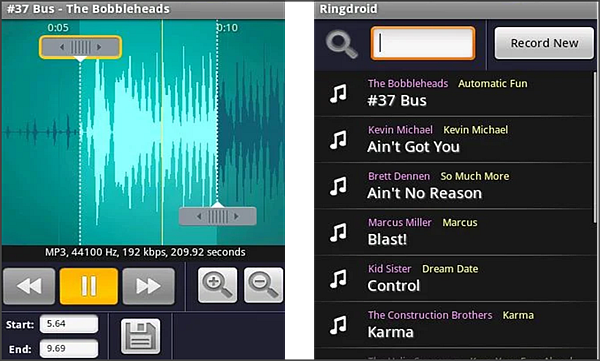 The application also allows you to record new ringtones and edit them using it with its powerful music editor. In my opinion, this app has the best interface among the other best ringtone maker apps for android I showed you during this article. 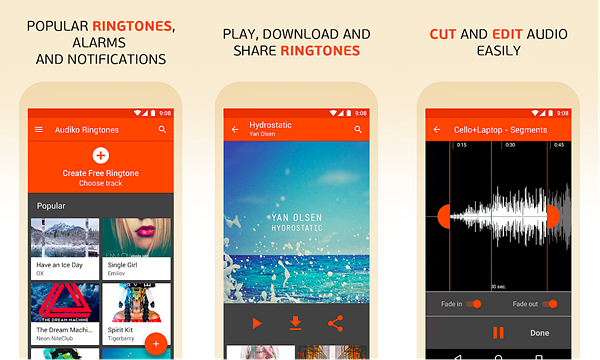 Audiko Ringtone Editor has many included tools and features starting with its huge library of tracks, 10,000 breathtaking HD and 4K wallpapers, Ringtone Editor to edit and cut your tracks using the waveform representation. You can also assign individual notifications for your contacts, messages, or alerts after making them using the application. Audiko is not specialized only in audio editing, as it provides you with a huge number of wallpapers in high quality to use them as the main screen or lock screen wallpapers. 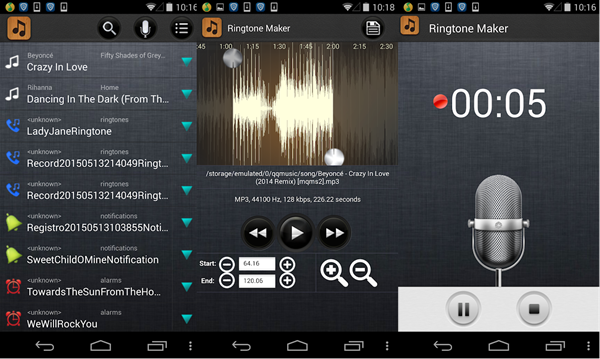 As I mentioned before, there is a huge number of audio editing applications available via Google Play Store, but in the last few lines, I provided you with the best ringtone maker apps for Android selected by our team, you may choose the features over the experience or vice versa, but overall, I don’t recommend using any app out of this list. software, that’s Gihosoft Free Android Data Recovery, which supports almost any type of data including photos, music, videos, SMS messages, call logs, WhatsApp and Viber conversations and any type of documents. 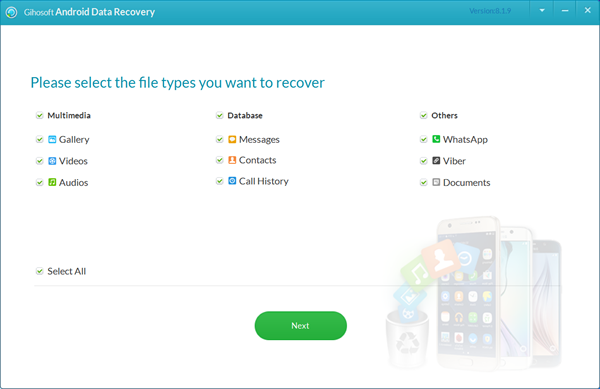 It also supports various brands of Android phones and OS versions with the ability to recover deleted data for any reason whether they are deleted due to a factory reset or accidental deletion or others. Stop thinking too much of the software that suits your case and helps you recover your lost data, and start downloading Gihosoft Free Android Data Recovery NOW!